Wikipedia defines a dibber or dibble or dibbler as "a pointed wooden stick for making holes in the ground so that seeds, seedlings or small bulbs can be planted. Dibbers come in a variety of designs including the straight dibber, T-handled dibber, trowel dibber, and L-shaped dibber." Actually, it doesn't have to be made of wood just like the one in the thumbnail. Unlike the usual pointed tool, you can even customize the tool's shape. The idea behind a customized dibber is simple. Unlike ordinary dibbers, this dibber has a customized head that has exactly the same shape and size of the seedling plug or root ball. In other words, it provides a perfect fit for the seedling's root ball and the hole that will accommodate it. The perfect fit prevents the unnecessary backfilling of extra soil into the hole which may easily damage a seedling's tender roots. With a perfect fit, forceful tamping of the root ball is also eliminated. Tamping down the seedling's root ball contributes to the breaking of brittle roots. The roots need not be teased out either. So the less the roots are disturbed, the better for the seedling. With a spatula or trowel, mix cement, sand and water in the mixing bowl. The ratio of cement to sand is 1:3. Mix until the wet concrete has the consistency of mortar. 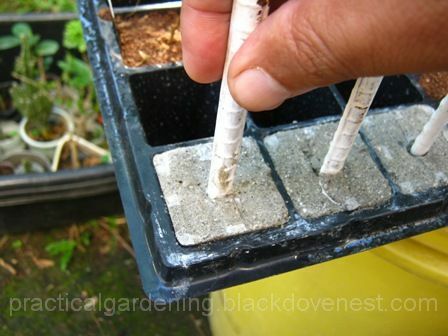 Clean out an empty cell in the garden seedling tray. Cover the drain hole at the bottom of the empty cell with a piece of masking tape. This will prevent wet concrete from spilling out, yet allow excess water to drain out. Pour the mixed wet concrete into the empty cell. When dried, this concrete part will become the garden dibber head. Tamp down the wet concrete forcefully so there are no air pockets left inside the cell. Warning: air pockets, when formed, compromises the integrity of the garden dibber head. Let the wet mix settle for five minutes. Pierce the center of the surface with the rebar. Bury it to a depth of 3/4 of the height of the cell. So if the cell is 2" deep, bury the rebar to a depth of 1 1/2". The deformed ribbing on the rebar creates a stronger bond for the concrete. The part of the rebar that is left exposed becomes the garden dibber handle. The ribbing creates a convenient grip for the gardener when handling the garden dibber. 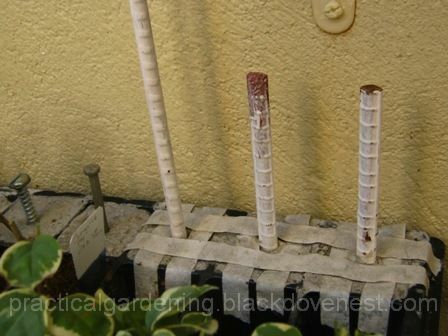 To keep the garden dibber handle vertical, apply masking tapes on four sides, as shown below (three garden dibbers are shown). Ensure the garden dibber handle remains vertical as the masking tapes are applied. 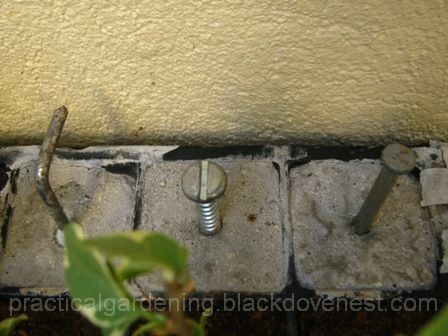 The tapes prevent the garden dibber handle from toppling until the concrete cures and dries. Moisten the concrete with a sprayer every two hours. For the next seven days, moisten once a day. After seven days, remove the garden dibber head from the cell of the garden seedling tray. 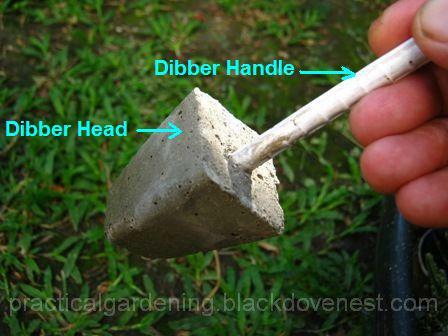 Rock the garden dibber handle to help loosen it from the cell. If the garden dibber head continues to stick to the sides of the cell, wedge a thin spatula to pry it away from the sides. Here I use a piece of x-ray film for making homemade garden plant labels or markers. 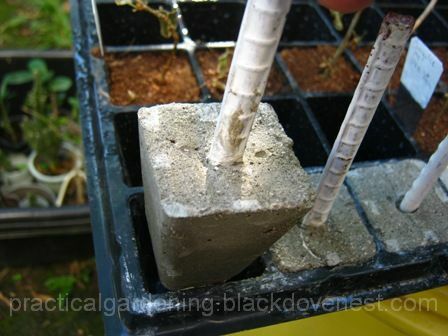 Pull out the garden dibber from the cell in the garden seedling tray. Submerge the dibber head in a disposable plastic cup of water to fully moisten it. Soak for five minutes, and do this once a day for the next seven days. Shown below is the fully formed garden dibber after soaking. The garden dibber will be ready for heavy duty use after 14 days. Paint the garden dibber handle with a heavy duty oil-based paint. Alternatively, the garden dibber handle may be prepainted as shown in the above example. Add an improvised dibber handle grip when using the dibber. Other than rebars, some hardware items like, screws, nails, hooks, etc. may be used for the dibber handle as shown below. 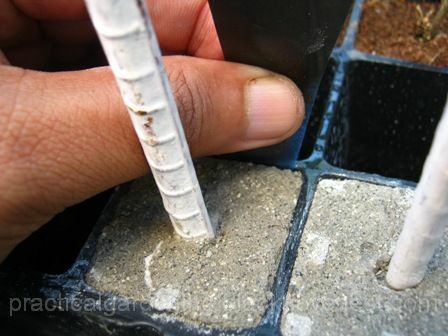 To learn how to effectively use the custom garden dibber for seedling plugs, here's an article on Repotting Seedling Plugs from the Garden Tray. Use cooking spray to lightly coat the inside of the cell before putting in the cement. That should reduce or stop the hardened cement from sticking to the cell. Yes, I guess a light coating of grease would work too. Thanks, good idea!